Scale, 22 lb. X 1 oz. (10 kg x 40g) capacity, 10-1/2" x 7-1/8" x 10-5/8", dial type, top loading, rotating dial, sloped face, white baked enamel finish. Scale by Johnson-Rose. This is a large kitchen scale and very accurate. and for the price you can not go wrong. 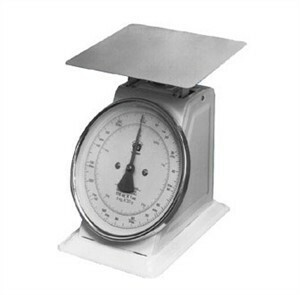 it has a pretty large platform on top for weighing larger items and a large dial face for reading. we were very pleased with the purchase. Perfect scale for a restaurant!